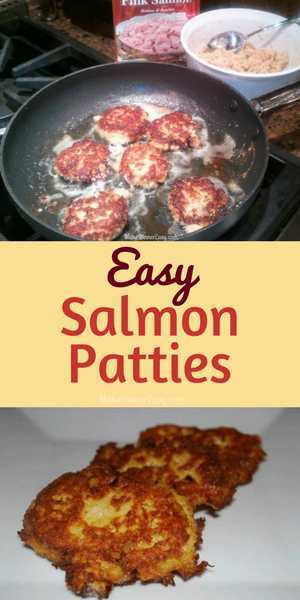 My husband grew up eating Salmon Patties and asked me to make them for our family. When I first started making these, I purchased canned salmon and really didn't like picking out the skin and bones. Then I discovered salmon that is sold in foil packets. Where I live, it is located in the same aisle in the grocery store as canned tuna. 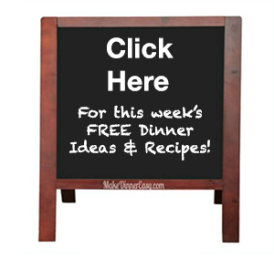 I find it much, much easier to use this type of salmon and I highly recommend it if you make this recipe! In a medium sized mixing bowl, combine salmon, onion, breadcrumbs, egg, salt and pepper. Then heat oil and butter in a large skillet on medium low. Using disposable rubber gloves (my preference) form 1-2 Tablespoons of salmon mixture into a patty (1 ½ “-2” in diameter). 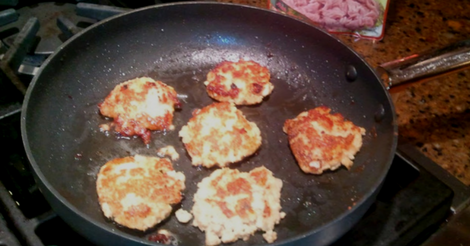 Place patties in pan and brown on both sides. It may take 4-5 minutes per side to brown. Remove patties to a paper towel lined plate and blot off any excess oil.